Harrington Industries has been manufacturing metal stamped products for nearly a century. Our metal pressing and steel stamping facility, located in Padstow, Sydney, has produced products for some of Australia's most prominent corporations, including Electrolux, Holden, Ford, Victa Lawnmowers, Toyota and many more. What sets us apart from our competitors is our focus on innovation, quality and ingenuity. From manufacturing Australia's first single stamped car door in the 1920s, to supplying titanium cases for heart pacemakers in the 1970s, Harrington Industries has always been at the forefront of steel pressing and metal stamping technology. In 1999, Harrington Industries was chosen to design and manufacture 14,000 Olympic Torches, 1,000 Paralympic Torches and 200 Community Cauldrons for the 2000 Olympic Games in Sydney. In 1987 we were also awarded the BHP Steel Award (Industrial Category) for the development of a new metal pressing and steel stamping forming process. This demonstrates Harrington Industries’ commitment to innovation and technical progress. At Harrington Industries, we only produce the highest quality steel products for Australian industry. We comply with the ISO 9001 and TS 16949 industry standards for our quality management system, which covers all of our metal pressing and steel stamping processes. We also belong to The Federation of Automotive Products Manufacturers (FAPM) and the Australian Industry Group (AIG). 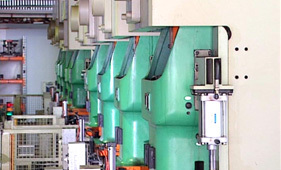 We pride ourselves in having the best equipped metal pressing and steel stamping facilities in the Australasia region. Our facility is equipped with the following presses. Harrington Industries employs over 80 staff, including a dedicated and experienced group of engineers. Our engineers are equally comfortable collaborating with a client’s own group of engineers or implementing metal stamping and steel pressing processes themselves. Find out more about our wide range metal stamping and steel pressing services by calling (02) 9771 2411 or by contacting us online.